Give the gift of a splendid spring day to a special friend! This pretty mix of blooming flowers in gentle, pastel shades is just the thing to show you care. Our floral artists arrange pretty blossoms such as spray roses, alstroemeria, cushion spray chyrsanthemums, carnations, and salal in a clear glass vase. Finished with a satin bow, the bouquet will add light and fragrance to any room. Arrives in a stylish glass vase with fresh water, ready to be displayed. Measures approximately 9" x 13". Splendid Spring Bouquet is a hand delivered gift. These gifts are delivered by one of our local design centers located throughout the United States and Canada. Same day delivery is available for most gifts when ordered before the cutoff time. 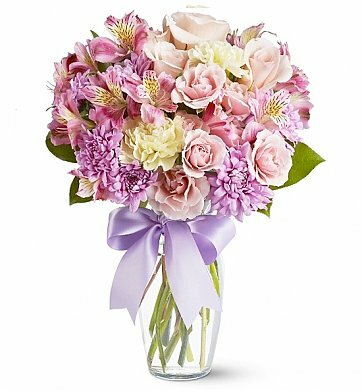 The cutoff time for Splendid Spring Bouquet is 2 PM in the recipient's time zone. My friend that received the arrangement just said they were awesome... She just loved them! Thank you! You never let me down! I ordered this gift from the UK and did not realize I had sent it to an incorrect address. The customer services rep worked tirelessly to track down the correct address and ensure the flowers were delivered in top condition. Great service, lovely flowers - can definitely recommend! Great bouquet for this price! I was looking for a "budget friendly" condolence bouquet and I found this arrangement; flowers and color combination says it all... not too sad but it does the job... delivered on time and lifts up someone's spirit despite their loss! the recipient of the flowers was so suprised and delighted. This not the first time I've sent a gift from your company. The recipent raves about how beautiful the gifts received are. I ve seen the products and it's always the best of quality.